If you're looking to rename a bunch of files in the Finder, and don't relish the idea of manually editing each file, one at a time, you need to look elsewhere for help. Apple actually includes a few solutions with Mac OS X. 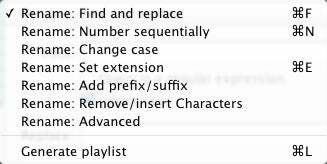 For example, if you activate OS X’s Script Menu (using the AppleScript Utility in /Applications/AppleScript), there are a few useful Finder AppleScripts that let you add text to, replace text in, remove characters from, and change character case in multiple item names. And those versed in AppleScript and Automator can use those tools to batch-modify the names of files and folders. The File List window is clean and easy to understand. On the left is the list of files you want to process. You populate this list by dragging files from the Finder. (Alternatively, you can click on the Finder icon or Path Finder icon above the list to use the current selection in the Finder or Path Finder, respectively, as the file list.) Pop-up menus above the file list let you sort the list by any of a number of criteria. Below each file name in the list is some information about that file. Click on a file to cycle that information between the file’s creation date/time; modification date/time; Finder comment; size; file extension, type, and creator; and file path. Finally, to the right of each file, File List shows the new name the file will take on after you process it. This display is updated in real time; as you make changes to the renaming settings (discussed below), the name-to-be immediately reflects those changes. On the right-hand side of the window are your renaming settings. Under Filter:Process, you choose which items in the list will be renamed: folders, the contents of folders, individual files, or any combination of the three. Find and replace Lets you replace particular text with other text. If you’re familiar with regular expressions, you can use them in the Find query. Number sequentially Lets you number files starting with the number you specify and in increments you specify. You can choose to retain the original name and/or extension, or retain the characters common to all files; for example, if all your file names include IMG_, you can keep that text and append your sequential number. You can also add a prefix or suffix of your choosing. Change case Lets you modify the case of each file’s name, extension, or both, changing to all uppercase, all lowercase, or capitalized words. Set extension Adds a file extension or changes the current extension; you can opt to apply the change only if a file has an existing extension. Add prefix/suffice Like the option in Number Sequentially, lets you add a prefix or suffix to item names. 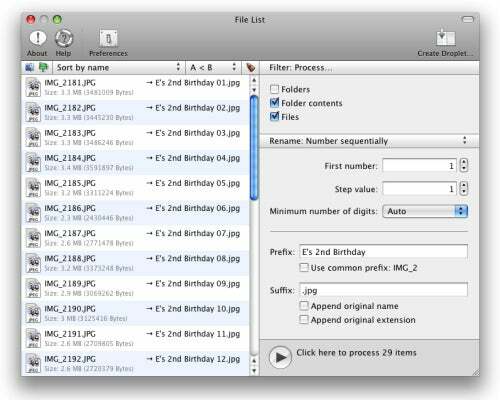 If you choose, File List can retain an existing file extension after the suffix; for example, to change Birthday.jpg to Birthday Party.jpg. Remove/insert Characters One of my favorite features, this option can remove any number of characters from each item’s name, starting from any position in the name. You can also choose to add new characters to those item names, again starting from any position. For example, if you’ve got files in the format IMG_2181.JPG, you could have File List remove the first four characters and then add "Macworld Expo” before the file extension, resulting in names in the format 2181 Macworld Expo.JPG. Advanced The developer provides a special Name Conversion Description Language (NCDL) you can use to combine any of the above options, as well as to perform more-advanced actions. This language is described in File List’s help files; in addition, several examples are provided to give you an idea of how the language is constructed. Generate playlist This option, which isn’t really related to renaming, lets you create a playlist file that can be imported, along with the associated media files, into iTunes or onto many non-iPod media players. Once you’ve chosen and configured your renaming options, and checked the name previews to make sure everything is set up correctly, simply click on the Start button (which looks like a Play button) at the bottom of the window. The renaming procedure is fairly quick, although the more files you're renaming, the longer the process takes. My biggest complaint about File List is that it doesn’t appear in the Dock or menu bar, nor does it appear in the OS X’s Command+Tab application switcher; while running, it's simply a floating window, but one that can be obscured by other windows. This is confusing, and it also means that it’s difficult to switch to File List if its window gets hidden behind windows for other programs. If this happens, you need to either use Exposé to find the window, or “launch” File List again (by, for example, double-clicking on its icon in the Finder) to bring the window forward. I recommend keeping the File List icon in the Dock for this purpose (which, of course, defeats the purpose of having a Dock-icon-free utility). I would prefer if a future version of File List acted like a standard Mac OS X program in this respect. This behavior also mars an otherwise useful feature, available via File List’s preferences, that can automatically populate the file list with the current Finder selection when File List is launched. In other words, if you want to rename the files in the current folder, just select them all and then launch File List; you won’t have to manually drag the files into the list. If you keep File List’s icon in the Dock, this feature even works if File List is already running; just select your files and then click on the File List icon in the Dock. (If you’re a Path Finder user, there’s a setting to instead populate the list with whatever files are currently selected in Path Finder.) But if you already have a list of files in File List and, because of the behavior described in the previous paragraph, you then “launch” File List again because you can’t find its window, you’ll lose that list of files if something else is selected in the Finder. This feature would be much more useful if File List acted like a standard application. Another complaint I have about File List is that you can’t delete individual files from the list; if, for example, you want to remove four files from your list, you need to clear the list completely and then add the files back in, minus the four you don’t want. I also wish you could choose which bit of information is displayed, by default, beneath each file name; even if you change the display, it reverts to Creation Date whenever you add new items to the list. Still, it’s tough to beat File List’s functionality and easy-to-use interface, especially for the price. I find myself using it on a daily basis to rename image files for Macworld articles. File List 1.2 requires Mac OS X 10.3.9 or later; the developer recommends 10.4.1 or later. Update 2/14/08 10:15am PT: A Universal version of File List, renamed Name Mangler, has been released. It features an improved interface and a few additional options, and it now behaves like a standard application.